In a market where products are increasingly commoditized and healthcare providers are being rewarded for outcomes, medical technology companies must realign their current and future business models to account for disruptive forces in the industry. Companies that have historically competed based on engineering skill and clinical evidence are finding new sources of innovation and value creation. Many medical device companies still struggle to unlock this value and find effective ways to partner with their healthcare customers. Firms that fail to capture this opportunity will fall further behind competitors who are creating revenue streams built on delivering outcomes supported by data-empowered services. The Life Science industry is in a state of flux. While recent years have seen the advent of multiple novel technologies—such as IVF, CRISPR-Cas9, virtual clinical trials, and liquid biopsy—the industry today stands at a crossroads with challenges in scaling up and commercializing such technologies. The industry has now come to terms with new, path-breaking life science technologies that are helping make precision healthcare a reality. Chinese investments into the US biopharma industry jumped to $4.5 billion in 2018. An exclusive fireside chat with our US and China analysts will uncover trends in cross-border investments and growth opportunities in these two markets. • Establish the leading factors that will influence the size and direction of the global life sciences market in 2019. • Build clarity on technology developments in the global life sciences market in 2018 that will have an impact during 2019. • Identify the business models used to commercialize and distribute novel life science solutions. • Discover the key growth opportunities and strategic imperatives for companies in 2019. In 2019, digital health will come of age. Favorable reimbursement policies for clinically relevant digital health applications will expand care delivery models beyond physical medicine. 2019 will be a reality check for two of the most hyped healthcare technologies of this decade—Artificial Intelligence (AI) and Blockchain. Globally, 2019 will be a year of value-based care as we expect the outcomes-based care focus to globalize. Access to affordable and quality care will be a key political agenda for upcoming elections in emerging markets such as Asia, Africa, and Central and Eastern European countries. Non-traditional players with digital technologies, such as Amazon, Ali Health, Microsoft and IBM, will provide the required impetus to public health systems to ensure accessibility and affordability of care. Medical cannabis use is driving industry revenues into the billions. Investments by pharmaceutical and Big Tobacco companies in the development of cannabis and CBD-based products and devices, along with healthcare-conscious consumers having access to these products, are spurring growth. Physicians, aware of increasingly widespread medical marijuana legalization, are interested in understanding the potential of these treatments. In US states where cannabis is approved, the use of prescription drugs, including the use of opioids, has decreased. The anti-aging industry is moving toward a “prevent-manage-repair” continuum that is creating novel market opportunities such as pharmacological targeting of aging, the “drug-as-a-service” business model, the use of digital pills to track drug consumption and adherence, and digital therapies that will help lower costs and reduce side effects. • Engage with thought leaders to understand the dynamics around significant market trends, innovative business models, and game-changing companies. • Uncover key investment opportunities and growth potential. Healthcare delivery is moving away from traditional healthcare centers such as hospitals and clinics. Other non-traditional areas are becoming centers for healthcare delivery to provide more urgent, convenient and cost-effective care. This path ends at home—where a patient spends the most time, is most comfortable and can recover best. This area provides opportunities for much more than just care delivery. Homes, if enabled with the right care equipment, devices, and technology, can serve not only patient screening, monitoring, and disease management, but also health and wellness monitoring opportunities. Several companies have already recognized this trend and, along with startups, are targeting it to capitalize early. Medical imaging has become a leader for the application of artificial intelligence technologies in the healthcare space, especially recently with deep learning techniques. This is evident from the fact that over 90 companies have set out to develop and commercialize AI-based solutions for the medical imaging industry. The number continues to grow as new start-ups emerge, as incumbents develop native AI solutions, and as tech companies move into the field, creating a highly dynamic ecosystem. With various countries edging past the innovator adoption phase and into the early adopter one, the time is now for stakeholders to refine and test their value proposition, partnership approach, and go-to-market strategies. · Gain expert insight into the accurate definition of digital therapeutics and market participants. · Learn about new solutions from mHealth companies that will combine apps, patient education, professional intervention and peer support to increase patient engagement and medication adherence by augmenting or replacing traditional drug therapeutics. · Hear opportunities to utilize digital therapeutics to improve medical workflow and patient communications. · Learn about some of the critical milestones related to digital therapeutics. Digital Transformation is powering growth opportunities in Smart R&D, Patient Engagement, and Healthcare eCommerce. The explosion of patient centricity and technological advancement in big data analytics, cloud and artificial intelligence are putting severe pressures on companies to leverage all types of data (clinical, social media, IOT, etc.) in innovative ways. While the industry is decidedly upbeat on this new trajectory, there are heightened concerns about managing data privacy, especially for data flows outside the traditional ecosystem. Frost & Sullivan is forecasting another year of disruptions in critical healthcare segments such as diabetes care, smart hospitals, healthcare cloud computing and digital pathology. This webinar will focus on these industries along with insights on key trends influencing the healthcare system, followed by a live question-and-answer session. The US medical imaging industry is transforming to cope with the challenges of the present and the demands of the future. The current care provision landscape is highly fragmented, and a coherent strategy is required to enhance interoperability among stakeholders across the imaging ecosystem. Stakeholders across the industry must also come together to eliminate redundancies and duplications, and streamline the imaging process, to improve the patient experience. 2018 will be a tipping point for mainstream adoption of popular digital health technology solutions such as artificial intelligence, mHealth/wearables, telehealth, Big Data analytics, and robotics. The transition of technologies from ideation to actionable applications will drive new opportunities across the globe. From data monetization unleashing the power of patient data to digital transformation of patient monitoring, there will be growing awareness of current inefficiencies and new opportunities identified to improve the efficiency of healthcare delivery. The industry is being disrupted by integration of the multi-disciplinary capabilities in biology, chemistry and computational power that companies can leverage to develop new solutions to diagnose, treat and manage chronic disease conditions, such as cancer, cardiovascular disease and diabetes. There is immense pressure on companies to build competencies in product development, manufacturing and distribution of new technology platforms such as point-of-care molecular diagnostics to capture new growth opportunities in the precision medicine market—a paradigm shift that will transform clinical practice and treatment outcomes. We invite you to join Frost & Sullivan’s Transformational Healthcare team and industry experts to discuss blockchain technology with the most potential applications across the healthcare industry, including data interoperability, cybersecurity, insurance fraud management, and drug supply chain provenance. Learn how to differentiate the hype from reality and hear key strategic considerations for future success. Digital health brings a diverse range of growth opportunities for vendors across the value chain. As the space evolves we have experienced a multitude of stepwise successes and stellar failures, yet funding continues to flood the sector. Major moves continue to come into the industry from the broader vendor environment, underlining the importance of health in everyone’s lives and progressively in strategic interests of the C-Suite across the ecosystem. 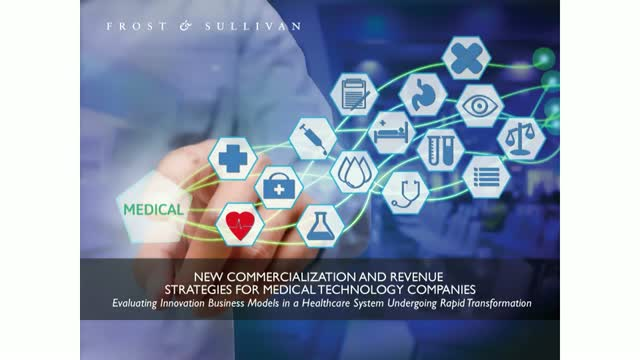 Join Frost & Sullivan in this webinar update showcasing different facets of the market, and learn why there’s something for everyone in digital health. Next-generation sequencing (NGS) has emerged as a key technology to deliver the next level of healthcare solutions. While the $1,000 genome was achieved in 2015, Frost & Sullivan predicts the $100 genome to be possible by 2024. The significant dip in cost of extracting genetic data has led to the creation of massive genomic data volumes that are expected to be some of the largest data sets globally by 2025, exceeding data generated by YouTube and Twitter. Hospital information technology (Hospital IT) spending in Asia-Pacific (APAC) will grow at a compound annual growth rate of 9.7% between 2016 and 2021 to reach an estimated end-stage market size of more than $15 billion. Key growth opportunities in the region include solutions for Healthcare Data Continuity, Patient Engagement & Experience, Healthcare Cloud, Big Data & Analytics, and Healthcare Cybersecurity. However, the identification of these growth opportunities is only the first step toward succeeding as an ICT vendor in this market. The real demystification lies in understanding very specific target customer needs and then building a value proposition and business model that addresses those needs. Our Healthcare webcasts cover Connected Health, Life Sciences and Advanced Medical Technologies to help you to better understand buyer-seller dynamics as the healthcare system transitions to digital information, the pace at which new and innovative medical devices and systems are being adopted and getting embedded into the typical clinical pathway, both in mature and emerging markets, and enables you to bring clarity to pharmaceutical/biotechnology, in-vitro diagnostics and life science research tools market decisions and implementation tactics.